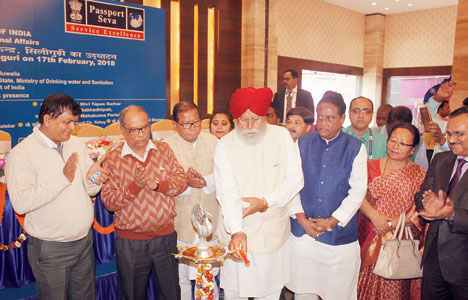 Siliguri: A longstanding demand of residents in and around Siliguri and other parts of north Bengal was fulfilled on Saturday when a Passport Seva Kendra (PSK) was opened here on Saturday. Union minister Darjeeling MP S.S. Ahluwalia inaugurated the facility at Matigara's Himanchal Vihar and said the centre would largely benefit people living in this region. Till now, residents of Siliguri and north Bengal had to visit the PSKs in Calcutta, Behrampore and Gangtok to get their passports done or to renew it. At the centre, officials said, appointments would be provided to 120 applicants every day. "Appointments from February 19 are available online. As of now, two counters will be opened and in due course, the infrastructure would be increased," said B.B. Kumar, the regional passport officer. The official also informed that soon, PSKs at the post offices will open up at Malda, Burdwan and Barrackpore. "There is also a proposal to set up a centre at the Darjeeling post office. We are working on it," Kumar said. The opening of passport centre is the second good news for Siliguri residents in past 24 hours. On Friday, officials of Airport Authority of India (AAI) had announced that they have received approval to commission the Instrumental Landing System (ILS) at Bagdogra airport from March 29. "It is yet another major development. We will be there at the commissioning of the ILS," said Ahluwalia. Siliguri mayor Asok Bhattacharya, along with MLAs Sankar Malakar, Sunil Tirkey and Sarita Rai, were present at the passport centre event. State tourism minister and Trinamul leader Gautam Deb did not attend the event. "I am busy with some family engagements, said Deb.